This weekend I sat on my couch and downloaded a movie I’d intended to watch for months. And then I watched it. After that, I downloaded another movie I also had an interest in. And I watched that one, too. And now I’m going to write about them. Watch out! It’s a party around here. As bad as things may seem in your life, just watch this movie and you’ll feel a lot better. That may seem like a horrible, egocentric thing to say, but it’s true. This powerful film makes you appreciate how easy things come for many of us — we have, to varying degrees, the means to actualize our dreams. Some more than others, but at least there’s a fairly reliable support network to fall back on. Precious has none of this. She’s invisible. No, she’s more than invisible: she’s practically written off; dead. Yet she slowly finds her voice and rises above it. It’s simply inspiring. And completely heartbreaking. It’s no secret that this is a hard movie to watch. The abuse — the most horrific of it occurs off camera — is beyond shocking. It sickens you. Yet, there is light and hope, as seen through Precious’ escapist daydreams and her desire to be a good mother. The script seems to jump around too much, often strangely condensing time or cutting away from a scene awkwardly. But the performances meet all the praise and awards they’ve received. Gabourey Sidibe is phenomenal. Mo’Nique even more so. And Ms. Mariah Carey — who knew? Powerful, brittle white people stressing over million-dollar photo shoots? I’m pretty sure this is the polar opposite of Precious. 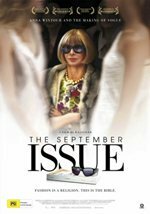 Anna Wintour is the most influential woman in that strange land known as “the fashion industry,” yet she’s not Miranda Priestly from The Devil Wears Prada. There’s no passive aggressive abuse or pursed-lip manipulation — or even a coat thrown on anyone’s desk, anywhere! Oh, she’s smart, and maybe she dialed back the bitchy for the cameras, but from what I saw, she’s a decisive, capable woman who takes emotion out of her business dealings. And I can see how people can find that threatening. But, to me, that’s how you get sh*t done. 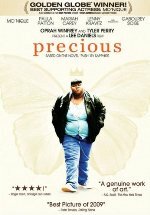 I have Precious in my Netflix queue but honestly, I don’t know if I can bear to watch it. It’s not easy to watch, that’s true. But there’s a lot of hope and healing in the film that balances out the horrific.